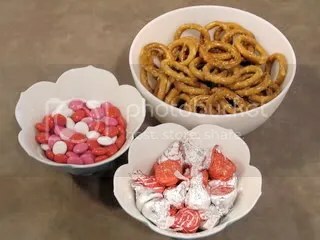 Valentines Day is only a few days away…do you have a special treat for your sweetie yet?Here is an easy treat anyone will love to make or receive! Step 1: Line a cookie sheet with parchment paper. 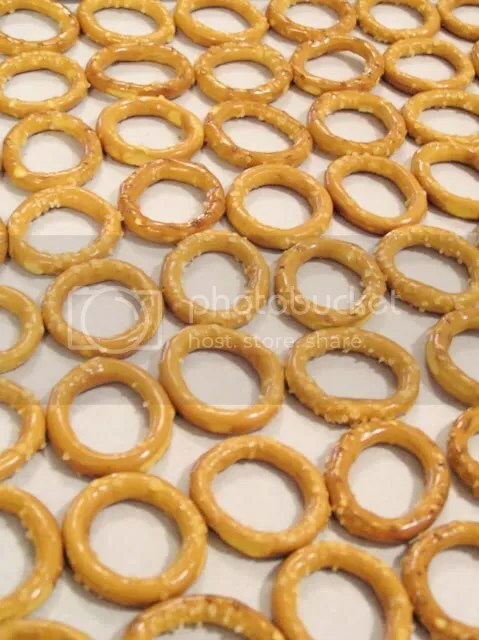 Line up the round pretzels in rows on the cookie sheet, try and fit as many as you can, but make sure the pretzels are all on the parchment and no pan is “peeking through”. Step 2: Unwrap the kisses. I used regular milk chocolate, hugs, and dark chocolate raspberry for mine. 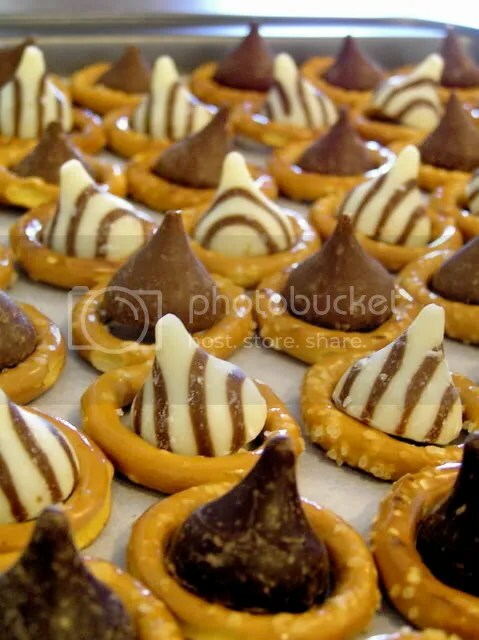 Place a kiss on top of each pretzel. Step 3: Place the cookie sheet in a 200 degree oven for about 5 to 10 minutes. Once the chocolate has melted, you can take them out. 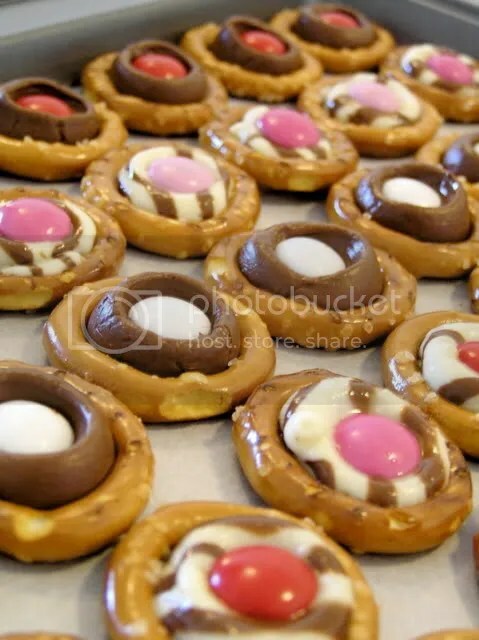 Step 4: Take an M&M and press lightly in the center of the kiss on each pretzel. This allows the chocolate to completely fill out the pretzel. The M&M’s purpose is to ensure the chocolate stays attached to the pretzel once they have cooled. Step 5: Let cool completely before removing from the parchment. Enjoy! They’re delicious made with Rolos as well, for extra caramely gooyness! Yum! And with all the different flavors of kisses I’ve collected (have to hit the store for Rolos though! ), I could make so many flavors! Thanks for the great recipe! Those look positively delicious! I love the effect of the Hugs. Where do you find round pretzels, and who makes them? I tried two grocery stores with no success. These do not look nearly so good with other shapes. I have bought round pretzels by Jays (they make potato chips) and the ones I got recently were by Better Made. I know Wal-Mart doesnt carry round ones, at least the ones by me. I have found some at K-Mart, Pollys Country Market. They look heavenly! And so cute! Enamor, thanks for the sourcing tips. I will keep looking. i went to 4 stores looking for round pretzels, couldn’t find any! but i settled on some that are square and called waffle pretzels. hope the work! when i saw this idea this AM in my craft mag email i thought this is the PERFECT idea for valentines treats!! You can’t live without peanut butter, and yet you made these with M&M’s, instead of Reese’s Pieces?! I never thought of using Reeses Pieces and I have been making these for years. I must try that! Thank you hickninja. These are beautiful! I love how the hugs look. I called about a dozen stores in my area but could not find pretzel rounds anywhere. The rounds in Chex Mix are not large enough. I think I will go with the square “waffle” pretzels instead. 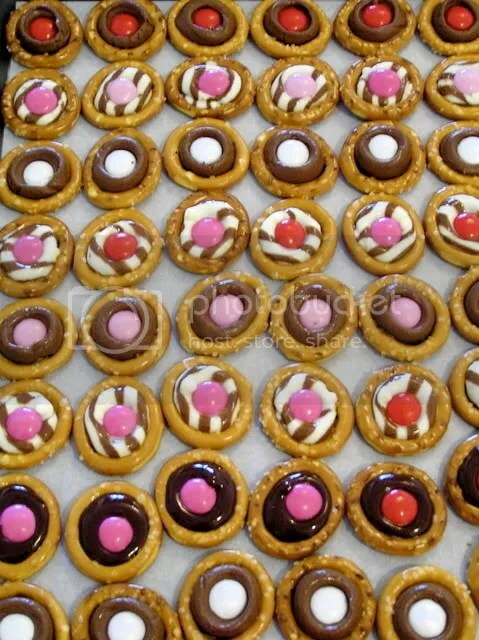 Pingback: Muses of Megret » Chocolate pretzel buttons.